One of the most common emails I get is "have you got drawings or plans for your jig?" I haven't up until now, or at least not decent ones, as the jig I'm using just sort of happened, based on a series of discussions and trial-and-error between myself and a friend. It's a fairly simple jig - it's nowhere near as user friendly as commercial ones, because there's no easy way to set angles and lengths in it. You cannot use it to design or lay out your frame. You must design the frame in CAD or similar first, then miter the tubes and set up the jig to fit the mitered tubes. Indeed pretty-much all it does do is hold the seat tube, head tube, and dropouts in plane while they're being pinned or tacked. This however is all you need to build a straight frame. That said, it does so for not a lot of cost and not a lot of machining. There is still some machining required - you'll have to have access to a lathe, and a pedestal drill is pretty-much mandatory. So the following picture shows the overall arrangement. Key to the design is a spine constructed from 120mm x 40mm 8020 extrusion. It's made in two pieces, with the bit at the back going down the center of the frame axis, and then the front section bolted to the side, so it's offset by 40mm. Vertical pieces are attached to the spine for the head tube and seat tube, using simple angle brackets, which are standard 8020 parts. The verticals don't need to be at 90 degrees to the spine - they can rotate to pretty-much any angle you want, to accommodate whatever head and seat tube angle your heart desires. Onto these are mounted the bits that actually hold the frame; angle brackets and cones for the top of the seat tube and either end of the head tube, and a machined block upon which the bottom bracket fits. The dropouts are held in place by a simple piece of 10mm threaded rod through the tail end of the spine. Spine rear piece: 360mm length of 8020 40-4012 profile extrusion. 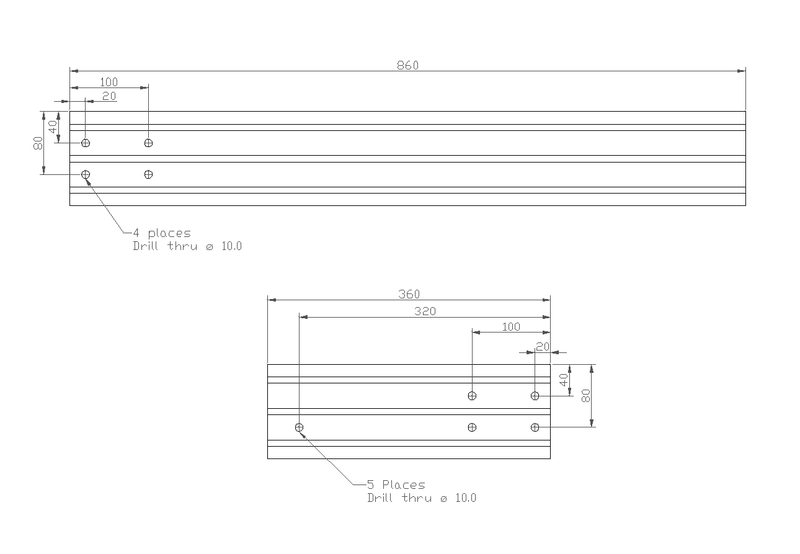 Spine front piece: 860mm length of 8020 40-4012 profile extrusion. Seat tube vertical: 780mm length of 8020 40-4080 profile extrusion. 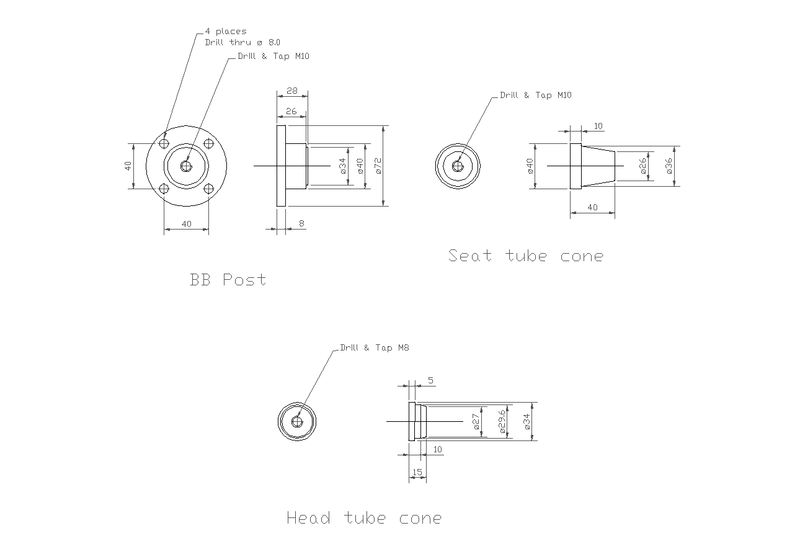 Head tube vertical: 600mm length of 8020 40-4080 profile extrusion. Small angle brackets: 4 x 40-4302 two hole 40 series inside corner brackets. Large angle brackets: 3 x 40-4311 six hole center 40 series inside corner bracket. T-nuts: 24 x 40-1981 economy offset t-nuts. 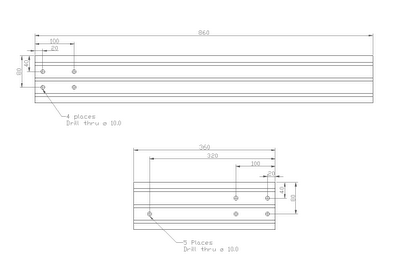 Bolts for angle brackets: 20 x M8x1.25, 15mm bolts. Button headed capscrews are ideal. I bought hex headed bolts and have been complaining ever since. Bolts for BB mounting block and head tube cones: M8x1.25, 25mm capscrews. Dummy axle: 160mm length of M10 threaded rod, with six M10 nuts. Bolt for seat post cone: M10 x 80mm bolt, with M10 nut. I actually used a length of M10 threaded rod here, with two nuts. Bolts for holding spine together: 4 x M10 x 90mm bolts, with 4 x M10 nuts. Once that's done, just bolt the two pieces together using M10 bolts and nuts. Make these pieces from mild steel. Note that two head tube cones are needed. These are sized for 31.75mm head tubes. If you're going to use other sizes, scale them proportionately or else make a cone that works with either. 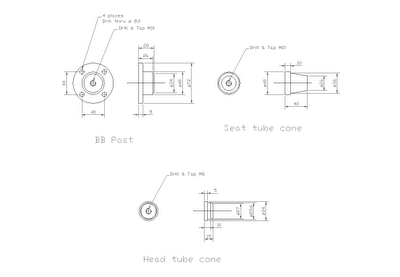 The headtube cones are just bolted to the large angle pieces using M8 cap head screws. The seat tube cone is mounted using an M10 bolt, so you'll need to open the hole in the angle piece out to 10mm. In use I find the best way to set up the jig is by laying it horizontally, loosening off the bolts holding the small angle pieces in, then sliding the verticals around to the right spot. Finally I use G clamps to pull the verticals hard up against the spine before doing up the bolts in the angle pieces - this way the verticals are held snug against the spine. 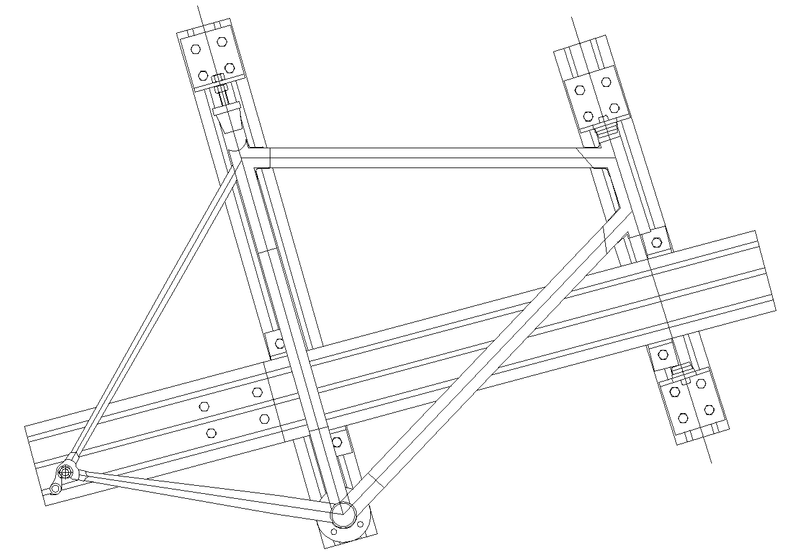 Always measure the angles of the frame itself, not the jig. Getting the vertical pieces set up just so can be a bit of a pain, but it beats the hell out of a piece of flat bar. At the moment the dropout supports are simply a piece of 10mm threaded rod with some nuts on it. This is reasonably accurate, but I plan on making a cheek piece that I can use to bolt a proper dummy axle on with. Suzy, why would "button headed capscrews" (are these simply Philips head screws?) be better than hex head scres for assembling the jig? On the small angle brackets that hold the vertical pieces to the spine, I have to use a 13mm spanner to do these up, and the frame gets in the way, making it quite difficult. If you substitute these: http://www.mcmaster.com/#socket-head-cap-screws/=epuin8 then you can use an allen key to do them up, which would be a lot easier. Thank you for posting the details. Will be very helpful when I build a jig. This looks great, thanks for posting it. 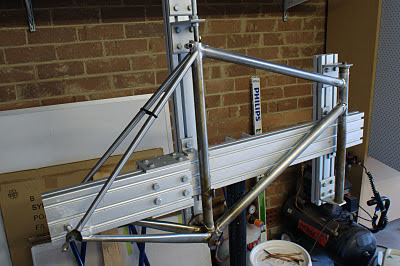 Just one question -- how do you hold the jig up for working on the frame? Bike workstand, vice, ? Been away for a while and I have just found your new site (I have put a link on my blog) and was really impressed with the polished stainless frame. Very similar to my project. I really love the look of polished stainless lugs on a frame. Keep up the good work.